Rate this Article Whether it is on your PC or on your mobile, Zzzslots is guaranteed to have a slot game that you’ll enjoy playing! Having too many choices can actually be somewhat a bad thing. How is it possible to choose an online casino site to play your favorite slot games on? There are just so many of them! Well, if you don’t us chiming in, we might just have a site that you can check out – Zzzslots! Although it is recently established, Zzzslots has already accumulated over 3000 free slot games for you to play! Of course, all of these choices can be a bit overwhelming and you can’t possibly – or can you? – play them all. Thus, the site provides a helpful filter tool that you can use to narrow down the games they have and only view the ones you’d really like to play. These games are generally separated by their type (Classic, progressive jackpot, no-deposit slots and more), paylines, themes and providers. So, let’s say you’re interested to play a game that fits the Valentine’s Day theme that’s coming up within a few more days. So, by simply clicking on Slots by Theme and then choosing Romance, you will end up with games like Secret Romance, Lover Machine and Cherry Love which are perfectly matched to all the love currently in the air. Aside from having a plethora of themes, there are plenty of unique slot games in Zzzslots too! One of these special games that have caught my eye is this Greece-themed slot game called Gems of the Gods. The game embeds the gameplay of a basic match-3 game within the frame of a slot machine. So, as opposed to referring to paylines, you simply need to get 3 gems in a line to win. The amount of your reward will be based on the color of the gems you matched, and naturally, the more gems you match in a line, the better your rewards will be. 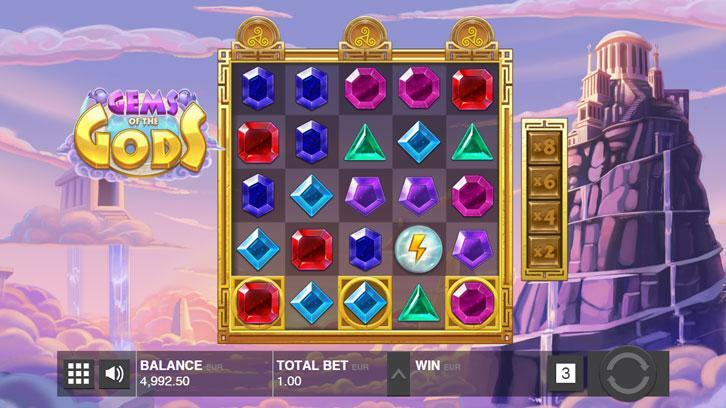 Gems of the Gods is also among the many mobile slot games that are available on Zzzslots. So basically, you can play Zzzslots’s games while you’re on the go! Not to mention, most of these mobile slot games are also available on PC, so in truth, you can actually play the game whenever and wherever you like. There are lots of other casino games on the site, including blackjack, craps, video poker, online bingo, and baccarat that you can play for free as well! We’re not even at the best part yet – the most attractive aspect of playing slot games on Zzzslots is the option to play for fun or play for real cash. This isn’t exactly a one-of-a-kind feature, but it is nice to not feel pressured to play using real cash when you’re not ready for it. You could take your time and spend the free credits you get (the amount of credits varies from machine to machine) before deciding to put in a deposit. Of course, the winnings you get while playing the game using credits cannot be converted into real cash. Love to grab some free spins on your mobile? You can! Zzzslots provide a nice list of bonuses which you can then use to get some free spins. In fact, by simply subscribing to the site’s newsletter, you can also get some extra free spins, access to exclusive game offers, and even free chips! So, what are you waiting for? Drop by Zzzslots now and start winning!